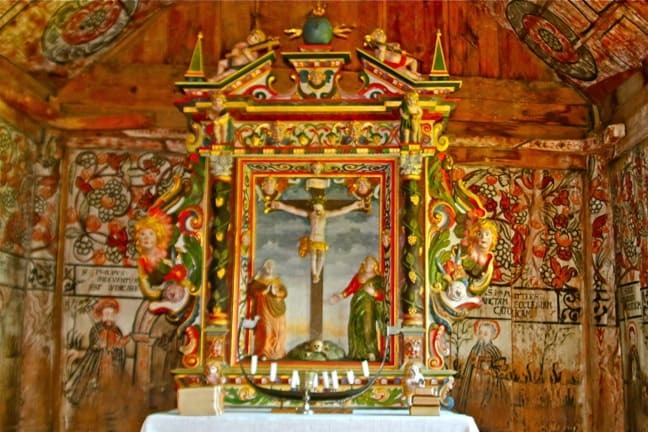 Do a Google Image Search for photos of Norway’s Urnes Stave Church and you’ll find hundreds of results. 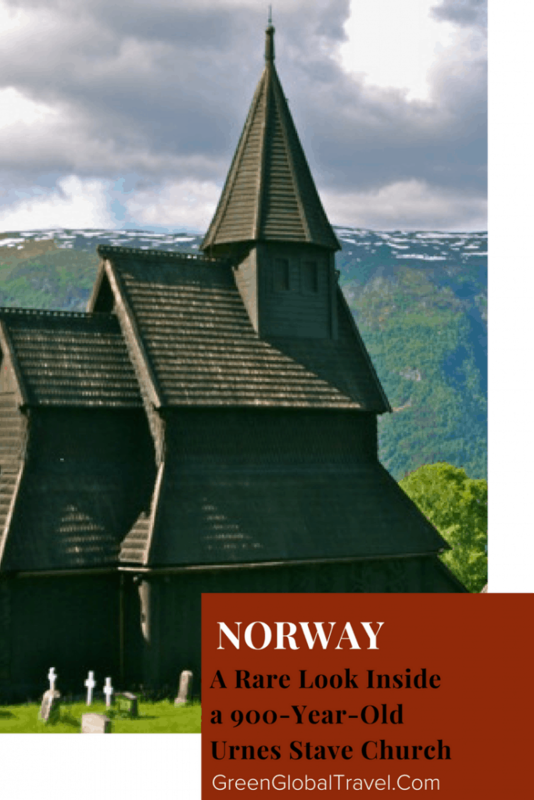 But if you scan through them, you’ll notice that 99.9% of these are exterior shots, and the few interior shots that do show up are actually from one of Norway’s 27 other stave churches. 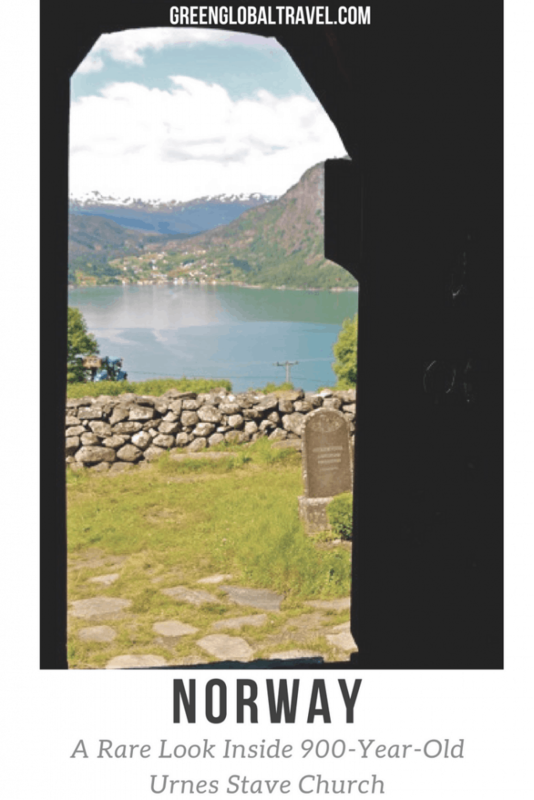 There’s a reason for this: Fortidsminneforeningen, the Society for the Preservation of Norwegian Ancient Monuments (which owns 8 stave churches, 4 stone churches, and 28 other historically significant properties in the country), strictly forbids photographs from being taken inside Urnes. Knowing that we were journalists visiting Norway on assignment, our guide Marit Boen allowed us to take photos during our private tour. 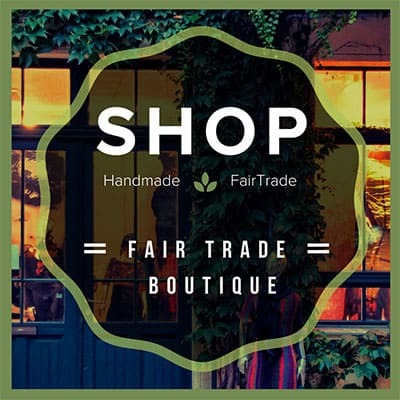 But we had to get special permission from Fortidsminneforenignen in order to publish them here on Green Global Travel, which they recognized as being similarly devoted to cultural preservation. So we’re delighted to offer our readers an incredibly rare glimpse inside this 900-year-old UNESCO World Heritage Site. 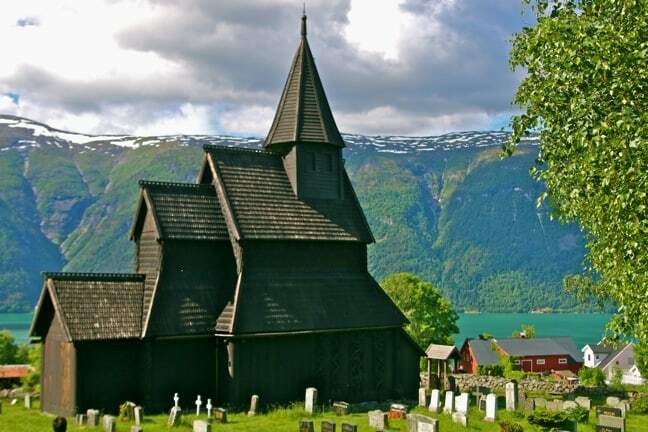 Stave churches are wooden Christian churches dating back to medieval times. 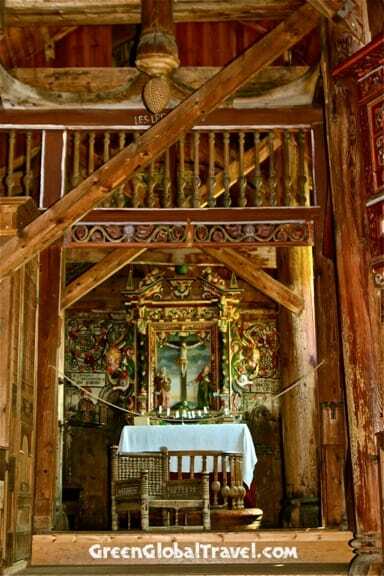 The name comes from the timber framing construction: The load-bearing posts were known as stafr in Old Norse, or stav in Norwegian. 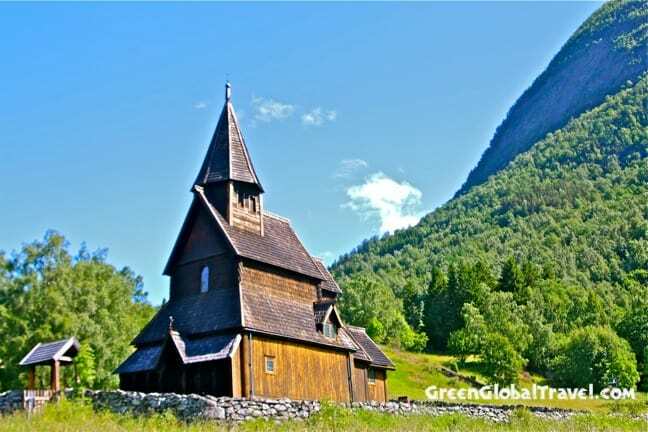 Once common in northwestern Europe, stave churches are now found primarily in Norway. 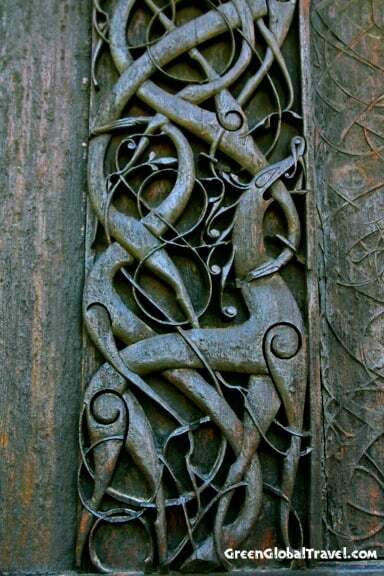 They’re important because they provide a historical link between the ancient art and architecture of the Viking Age and that of Christianity. 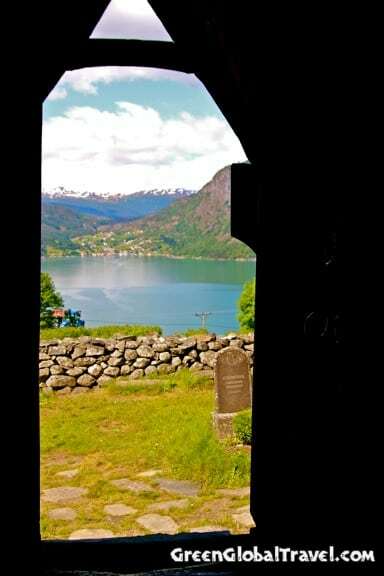 Urnes, the oldest Stave Church in the world, was built around the year 1130 on a hill in Norway’s Sogn og Fjordane county, providing spectacular views of the Lustrafjorden. But archaeological excavations have revealed that this is actually the fourth church built on the site. The famous north wall (pictured here) features elaborately decorated sections from the previous church, including the ornate door, wall planks and a corner post. 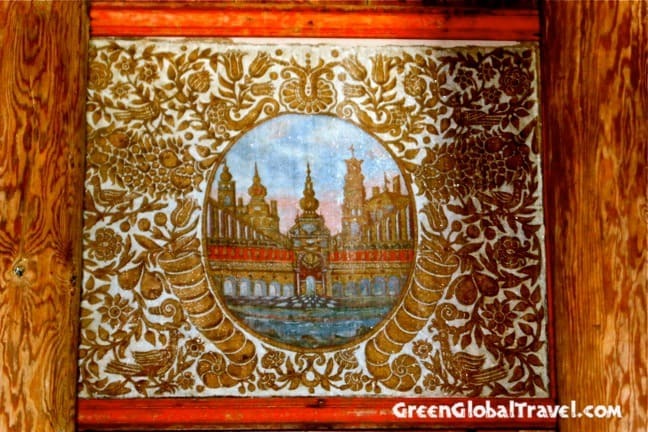 Decorated gables from that church are now covered in order to preserve them. As the last tour group leaves and we enter the church for the first time, Mary and I both murmur “Woooooow” in reverent awe, our voices reverberating off the ancient timber. Massive wooden columns (a.k.a. staves) frame the center space, leading the eye up to rounded arches made from the strong, naturally curved part of the tree where the roots and trunk meet. Huge wooden beams (added in the Middle Ages) criss-cross the high central nave and chancel area in order to provide additional structural support. A Medieval chandelier hangs down from the ceiling. 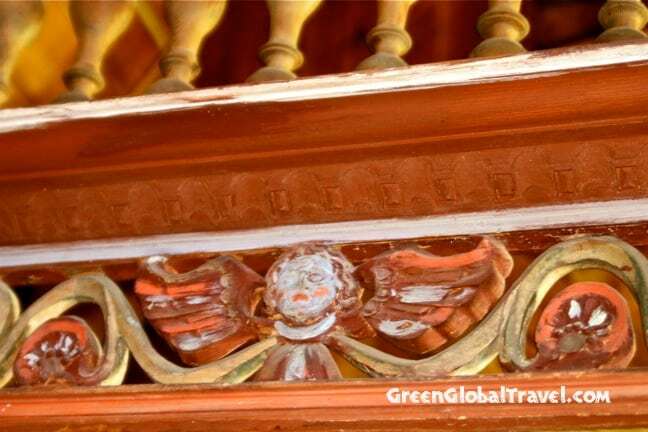 At the top of each stave is a capital that provides cushioning support, each of them hand-carved with images similar to those found in The Book of Kells. There are 50 capitals in all, depicting everything from animals to religious pilgrims. 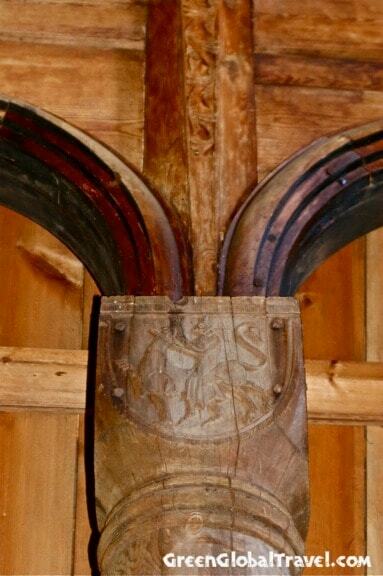 The most significant of these images is that of a bishop: The style of his hat helped historians date the church to the 12th century before carbon dating revealed that the timbers used in construction were felled in 1129-1130. 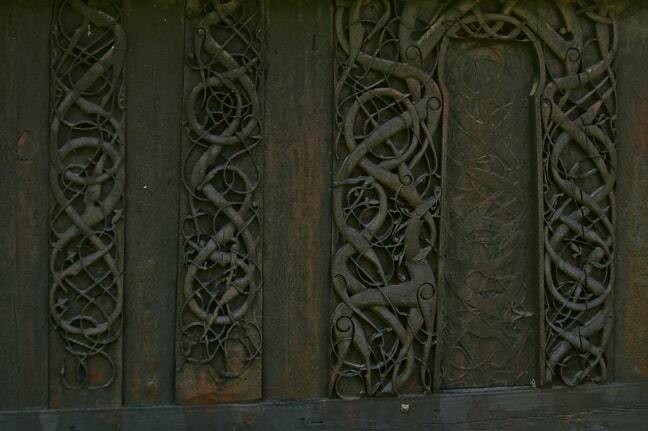 The intricate detail on the woodwork inside Urnes Stave Church is striking. 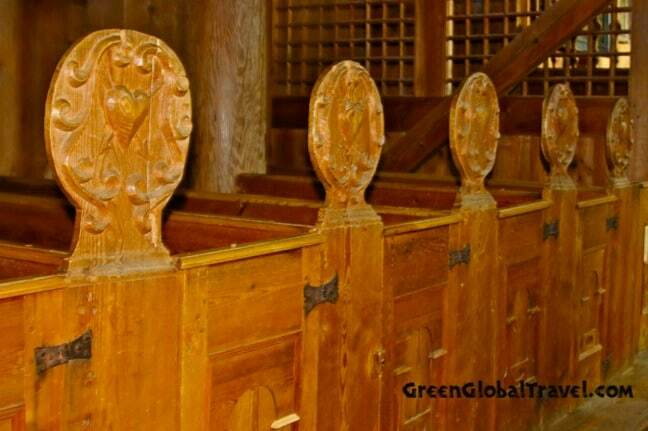 These pews were put in place after the Protestant Reformation of 1537, with women and men sitting on opposite sides of the aisle. At the front of the nave, behind the latticed chancel screen, is the Krokastolen (a.k.a the Munthe Family Pew), an enclosed pew created in 1662 for a wealthy family from the area. Because the worship of saints was prohibited after the Reformation, most of the oldest church art disappeared once Martin Luther’s teachings came to prominence. A carved Madonna and a male head carved from wood are currently on display in the Bergen Museum. But a wealthy family later commissioned this ornate painting, which is believed to represent Heaven and is made from bits of glass mixed with paint to make it shimmer like gold. Many of the church’s interior design elements were added in the 17th century, including a baptismal font (1640), a wooden canopy above the altar (1665), a pulpit (1693–1695) and the altarpiece (1699), which depicts Christ on the cross flanked by the Virgin Mary and John the Baptist. But the group of figures pictured above, depicting the historic crucifixion scene at Golgotha, date back to the 12th century. There’s also a 12th century medieval candelabra in the shape of a ship atop the altar, evoking images of Norway’s Viking past. According to Marit, this ship holds nine candles, which is considered a sacred number in Norse mythology (see: nine worlds supported by Yggdrasil, the valknut symbol of three interlocking triangles forming nine points, nine surviving deities of Ragnarök, etc.). At the end of every service at Urnes, they’d ring the bell nine times. 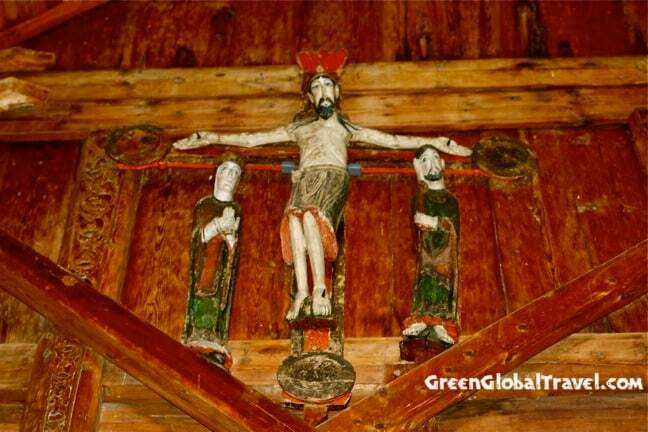 So, despite the best efforts of Christianity to eradicate Paganism, its influence remains obvious in Norway today. Our special thanks go to Fortidsminneforenignen: Visit their website to help support the preservation of Norway’s ancient monuments. Our trip was sponsored by Visit Norway and Fjord Norway, with clothing provided by Helly Hansen and luggage provided by Eagle Creek. But we will never compromise our obligation to our readers. Our opinions remain our own.